Brewer Science FHE flex arrays deliver highly sensitive, drift-free, and real-time responses to varying angles of deflection. The flexible hybrid electronics (FHE)-based flex arrays are a revolutionary approach to using carbon-based semiconductor technology to solve problems with existing flex sensor technologies. The array is a flexible solution to prevent false/positive signal creep while still collecting data, even during a continuous bent state. Our custom designs and printing methods allow FHE flex arrays to be a fully digital, ready-to-incorporate solution to your unique system or needs. Flex sensors, also known as bend sensors, measure the bend, or deflection, of an object. Flex sensors are used by measuring the resistance of the sensor’s elements. 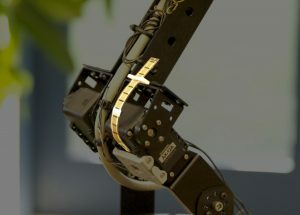 When the flex sensor array is bent forwards or backwards, particles in the active layer move closer together, decreasing resistance, or move further apart, increasing resistance. When the sensor straightens out again, the resistance returns to the original value. Measuring the resistance can determine how much the sensor is being bent. Resistive-based flex sensors are used to measure the flexing or bending of an object with little to no effort. Due to its unique form factor, FHE flex arrays are light-weight and are great for measuring bi-directional bend in confinded spaces. The array creates a fully digital output that is IoT plug-and-play ready. This gives the user endless opportunities for integrating into a variety of numerous applications where multiple sensors are needed in a small space and analyzed by the digital microcontroller.